Taking Flight: Front page of the Milwaukee Journal. Lead Issues. Lead shot from firearms and lead sinkers have been a mainstay of hunting and fishing for generations, but a growing body of research and anecdotal accounts are raising health questions for humans and wildlife alike. The most recent situation involves trumpeter swans in northern Wisconsin. 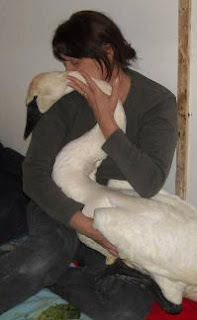 Since October, 10 trumpeter swans have been treated by the Raptor Education Group Inc. in Antigo. In a typical year, the center takes in only about two of the birds. Three of the trumpeter swans have died and three are in critical condition. X-rays revealed all had metal shot or sinkers in their bodies. Blood tests showed elevated levels of lead. Also, a report released in November shows lead residue from gunshots has been found in Wisconsin venison, after concerns were raised in other Upper Midwestern states. In Wisconsin, 15% of 199 samples of commercially processed venison contained lead bullet fragments, according to the report by the Wisconsin Department of Natural Resources and Department of Health Services. In hunter-processed venison, 8% of 98 samples contained lead fragments. The study used modeling from the U.S. Environmental Protection Agency and suggests there may be a risk of elevated lead levels in blood among children who consume venison. One of the worst-case scenarios involves children 7 and younger who eat two meals a month of venison that contains higher amounts of lead. The children may have a 90% chance of lead levels in their blood rising above tolerable limits set by the Food and Drug Administration. The two state agencies concluded that lead in venison was an "indeterminate public health hazard," as elevated blood-lead levels hadn't been confirmed in consumers of deer meat. The agencies are recommending that food pantries use meat processors that minimize bullet fragments in venison. As for what to do about lead shot, the Department of Health Services - but not the DNR - recommends the "eventual transition to non-lead ammunition." Efforts to phase out lead shot began in the 1970s. It has been banned nationally for waterfowl hunting since 1991 and on federal wetlands and grasslands where waterfowl are raised. Lead can damage the brain, nervous and reproductive systems. It is no longer used in gasoline, paint, pesticides or as solder in metal cans. The lead-shot ban has helped reduce poisoning of ducks and geese, but federal authorities still estimate millions of pounds of lead from hunting and fishing are deposited on land and in the water each year. Starting last fall, the DNR began requiring mourning dove hunters to use non-lead shot because of the birds' proclivity to feed near wetlands where other wildlife could ingest shot. DNR Secretary Matt Frank pulled together an existing working group on lead contamination in July and asked members to gather the latest data and take a closer look at the issue, spokesman Adam Collins said. The agency also provides information for deer hunters on reducing exposure to lead in venison and urges anglers to consider switching to nontoxic metals. But the DNR has pushed for no other restrictions. Lead is still heavily used for hunting upland birds such as pheasant and grouse, and it is the dominant choice of ammunition in deer hunting. This troubles bird advocates such as Marge Gibson, executive director of the Raptor Education Group. In one case, a pair of trumpeter swans were so weak they had to be pulled from the ice last month near Laona in Forest County. The birds died from lead poisoning. In another case, 69 lead pellets were found in an adult male swan from Solon Springs in Douglas County, Gibson said. It, too, died. "This is very frustrating," she said. "If people spent one day with us and watched these birds fight and struggle for their lives, things might change." Many sports enthusiasts have pushed for lead-shot restrictions. In 2007, members of the Wisconsin Conservation Congress voted against an advisory question requiring nontoxic shot for all game birds except turkeys, but there was significant support for the measure. Members voted 1,506 in favor and 1,850 against. The congress advises the DNR on hunting and fishing issues. On this issue, Kurt Thiede, DNR liaison with the group, said the congress has favored education over regulation. There is no question lead kills wildlife, said congress member Todd Kapp of Trevor in Kenosha County. But he is not sure whether scientists have proven conclusively that lead in the environment is killing wildlife. "Was it wadded up fishing gear or lead?" he said. "I just don't want to see a knee-jerk reaction to this." Cost and performance are other factors for sports enthusiasts. Nontoxic shot costs more. Kapp is also convinced that lead shot has more killing power. "When lead hits something, it flattens out and transfers into it," he said. Steel is harder, he said, "more bouncy, and the patterns are a little different." Tom Hauge, director of the DNR's Bureau of Wildlife Management, expressed concern about moving too quickly and antagonizing hunters. But, he said, "I think the lead bullets in venison reopened the door again. I do believe that over the past couple of years that a lot of things have changed." "There is much more widespread and compelling bodies of research out there - even in Wisconsin." • 16% of 583 Wisconsin bald eagles that died between 2000 and 2007. • 25% of 143 trumpeter swans between 1991 and 2007. • 29% of 26 loons beginning in 2006. The DNR study also found lead fishing tackle in all loons that died of lead poisoning. It also found the number of lead-related deaths in eagles spiked during the hunting season - especially in November, December and January - when the raptors fed on deer remnants. "It is unlikely that the prevalence of lead poisoning cases will decrease until the amount of lead discharged into the Wisconsin environment is reduced," Strom and his fellow authors concluded. The most recent troubles with trumpeter swans could be tied to drought conditions in northwest Wisconsin, where many birds spend summers, said Patricia Manthey, DNR avian ecologist. With low water levels, the long-necked birds feed in previously unreachable sediments. Also, Minnesota officials reported an increase in lead poisoning this winter after Wisconsin and Minnesota officials jointly asked landowners not to feed the birds. The states feared the feeding was keeping the birds from migrating. By congregating in open water on the St. Croix and Mississippi rivers, they could be exposed to disease and lead contamination. The plan backfired, said Dennis Simon, chief of wildlife management for the Minnesota Department of Natural Resources. Some of the swans that foraged on their own picked up lead, he said. Since October, half of the 32 trumpeter swans brought to the Wildlife Rehabilitation Center of Minnesota in suburban St. Paul were treated for lead toxicity, according to Philip M. Jenni, executive director. Despite the concerns about lead, eagle and trumpeter swan populations are growing. Eagles were removed from protection under the federal Endangered Species Act in 2007. The Natural Resources Board voted last month to remove the trumpeter swan from the state's endangered and threatened species list.